Ethical Trader wrote: MR said in his speech that the UNP should allow the Parliament to resolve this issue democratically. Then when the speaker called for a vote, rowdies started the commotion. 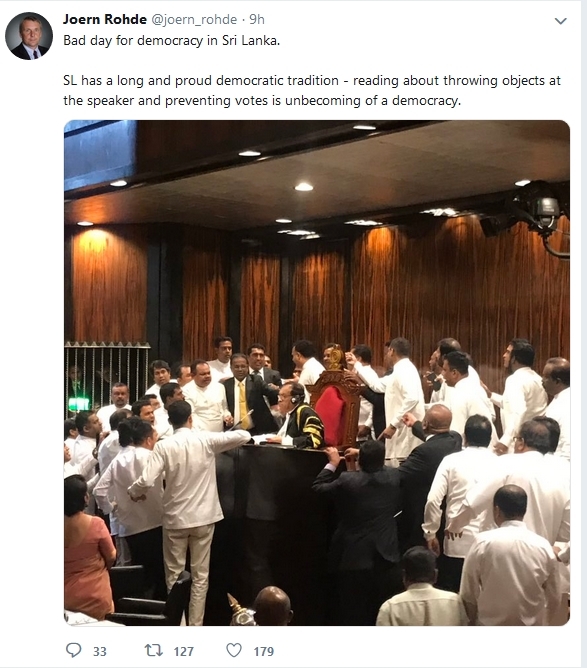 ?Can any one explain what MR meant by "UNP should allow the Parliament to resolve this issue democratically"
I think he says he wants now a General Election ! Am so glad this is not on live telecast for the world to see. Speaker has been attacked with Trash bin and Water Bottle! Yes MR requested UNP and all other parties to help him to dissolve parliament and go for an Election . I never thought we would fall to this low. malanp wrote: I never thought we would fall to this low. What else you can expect after you send this kind of people to rule us? 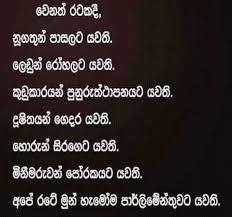 කවර හේතුවක් නිසාවත් රනිල් වික්‍රමසිංහ මහතාව නැවතත් අගමැති ධූරයට පත් නොකරන බව ජනාධිපතිතුමා ප්‍රකාශ කළ බව ලක්ෂ්මන් යාපා අබේවර්ධන මහතා මීට සුළු වේලාවකට පෙර මාධ්‍ය වෙත පවසා සිටියා. ඔහු ඒ බව සඳහන් කළේ ආණ්ඩු පක්ෂ මන්ත්‍රී කණ්ඩායම ජනාධිපතිවරයාගේ ප්‍රධානත්වයෙන් ජනාධිපති ලේකම් කාර්යාලයේදී පැවැති සාකච්ඡාවෙන් අනතුරුවයි. රනිල් වික්‍රමසිංහ මහතාව නැවතත් අගමැති ධූරයට පත් නොකරන බවට එම සාකච්ඡාවේදී ජනාධිපතිතුමා මන්ත්‍රී කණ්ඩායමට සහතික වූ බව ද ලක්ෂ්මන් යාපා අබේවර්ධන මහතා වැඩිදුරටත් කියා සිටියා. SLS if you really like to come forward , this is the time..